Washington Project for the Arts (WPA) has announced the names of the artists whose work was selected by Mera Rubell, Co-Founder of the Rubell Family Collection, from the WPA 36 Studios/36 Hours marathon in Baltimore October 26 and 27. WPA, a 38-year-old nonprofit organization presenting contemporary art and supporting artists in the Greater Washington region, invited Mrs. Rubell to serve as one of eight curators for its 33rd Annual Art Auction Exhibition, SELECT 2014. Each year, WPA invites prestigious curators from renowned institutions to select works which are exhibited for approximately one month and then auctioned to benefit the organization and artists. As an artist service organization, WPA is proud of its long history of equally sharing proceeds of the auction art sales with the artists (a 50/50 split). Beginning at 6am on Saturday, October 26, 2013, Mrs. Rubell set out on a 36-hour studio visit marathon throughout the city of Baltimore accompanied by Lisa Gold, WPA Executive Director, and a constantly changing entourage of reporters, photographers, collectors, gallerists, curators, and other arts professionals. From School 33 to the Creative Alliance and at many studios in between, Ms. Rubell listened to, questioned, prodded, and bonded with the 36 artists who were selected through the 36 Studios /36 Hours lottery. The marathon ended Sunday, October 27 at 6pm and culminated in a reception for all of the artists who applied for a studio visit as well as people in the Baltimore art community. The party, held at Rubell's Lord Baltimore Hotel, was attended by over 200 people and brought together the community in a veritable "love fest" of Baltimore art. Mrs. Rubell was initially tasked with selecting approximately 10-15 works by 10-12 artists. She ended up selecting 25 works by 19 artists. "There were so many amazing artists," exclaimed Mrs. Rubell. "People should know what's happening in Baltimore." As the visits were made in her role as a curator for WPA's Art Auction Exhibition, many considerations went into Mrs. Rubell's decision-making process, such as scale of the work and availability for exhibition. "The choices were very difficult," Rubell professed. "All of the work I saw was of high quality and the artists were extremely professional and talented." In a surprise announcement, Mrs. Rubell has arranged for the works she selected to be previewed in New York before the WPA SELECT 2014 exhibition. From January 11 through January 18, 2014, Marianne Boesky Gallery's uptown space (118 E 64th Street) will host Baltimore Artists + WPA + Mera Rubell = LOVE, an exhibition featuring the 25 works chosen through the 36 Studios/36 Hours adventure. The New York preview is a first for WPA and the SELECT auction. "I'm thrilled to be able to offer this incredible opportunity to these talented artists, the majority of whom have no gallery representation, and to be able to bring together the Washington, Baltimore, and New York art communities through our inspired adventure and this wonderful exhibition," said Lisa Gold. Amanda Burnham, Michelle Dickson, Dave Eassa, Alex Ebstein, Cliff Evans, Sean FitzPatrick, Ryan Hoover, Jason Hughes, Tiffany Jones, Gary Kachadourian, Magnolia Laurie, Curtis Miller, Cara Ober, Rachel Rotenberg, Ginevra Shay, Jo Smail, Ryan Syrell, Alessandra Torres, and Stewart Watson. SELECT 2014 will be on view February 27 through March 21, 2014 at Artisphere, 1101 Wilson Boulevard, Arlington, VA 22209. Hours are Wednesday-Friday: 4 - 11pm; Saturday: Noon - 11pm; Sunday: Noon - 5pm; Monday & Tuesday: Closed. Admission is free. Baltimore Artists + WPA + Mera Rubell = LOVE will be hosted by Marianne Boesky Gallery, 118 E 64th Street, New York, NY 10065 from January 11 through January 18, 2014. Hours are Tuesday - Saturday: 10am - 6pm. Admission is free. 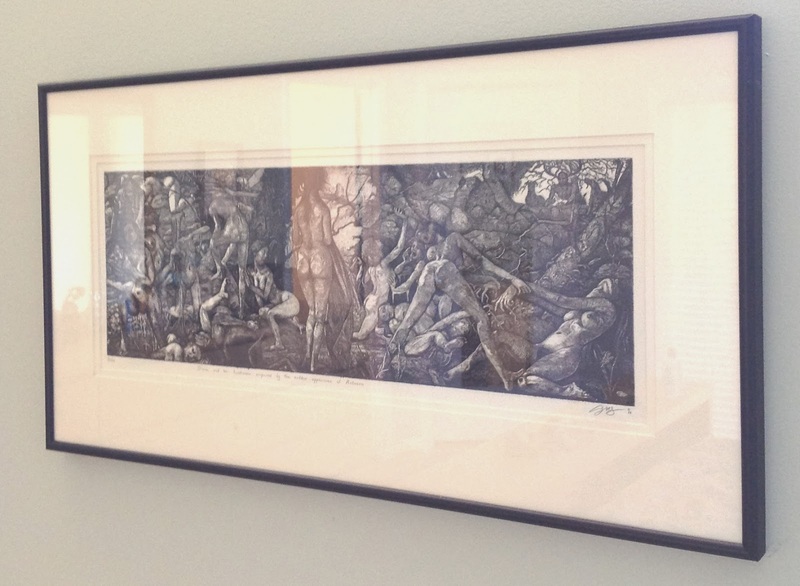 This is Diana and her huntresses surprised by the sudden appearance of Actaeon by the immensely talented Pennsylvania self-taught printmaker Grant Silverstein. You can buy Silverstein etchings here.